Doctors Wonder If It's Time To Rethink Fly-In Medical Missions : Goats and Soda These trips — where volunteers from the West perform surgeries in poorer countries — are a multibillion-dollar endeavor. But is this the best way to provide health care to needy nations? In 1969, volunteer teams of doctors and nurses from a U.S. charity called Interplast began flying to poor countries to do reconstructive surgery. They operated on children with cleft lips, cleft palates or burn scars so thick their limbs were immobilized. It sounded like a great idea. The team members donated their time, paid for their travel and lodging and sometimes their supplies, and got to do good. They were among the first teams of Western docs to take part in fly-in missions. Soon other medical groups as well were traveling to remote areas of the world, where they performed heart surgery, cataract removal, hernia repair, dental care and more. Today, missions are sponsored by churches, universities and charities. There are for-profit missions as well that collect fees from volunteers, mostly students. A 2016 estimate put the annual cost of getting doctors and other health care workers to sites around the world at $3.7 billion, paid for by donors or health personnel themselves. But today there's some real soul-searching going on about this kind of fly-in. At conferences and in academic papers, health professionals are asking: Is this really the most effective way to provide health care to the developing world? "Missions are recognizing that there's a lot of criticism being leveled at them," says Lawrence Loh of the University of Toronto's Dalla Lana School of Public Health, who studies short-term volunteering. "There are a lot of concerns about what happens when these missions leave, and there's a lot of concern that the care they're providing may not be culturally appropriate" — or even wanted by the people on the ground. The group that pioneered reconstructive surgery fly-ins back in 1969 was one of the first American medical missions to rethink its mission. More than two decades ago, Interplast began what has become a near-complete makeover. That process proved to be a battle — it's tough to change mindsets — but it had huge rewards. After it was founded by a reconstructive surgeon at Stanford University, Interplast soon became a popular model for flying teams of doctors and nurses into remote areas to provide medical services otherwise not available. According to a case study by the Stanford Graduate School of Business, by 2002 another 104 organizations were running short-term reconstructive surgery clinics around the world. The groups were competing for donations — and even for volunteers. Sociologist Judith Lasker, author of the 2016 book Hoping to Help, worked with the Catholic Health Association on a study that showed that about half the money spent on medical missions goes for travel costs for the teams. "It doesn't seem like a very cost-effective strategy," she says. After she told a local health provider in Haiti the cost of the airfare for bringing in a single American doctor, the Haitian said to Lasker, "Imagine how many antibiotics that could buy." At its height, Interplast (which later changed its name to ReSurge International) had about 400 volunteers setting up as many as 36 medical camps a year in Central and South America and across Asia. On average the volunteers performed 75 to 100 surgeries per one- or two-week trip. "We treated the patients pretty well, but we didn't treat the local doctors really well," says David Dingman, a former University of Utah surgeon who served as chief medical officer of ReSurge for years. "We weren't teaching them." A local surgeon here and there might have scrubbed in, but the visiting doctors ran the show. And then, in 1991, ReSurge surgeons working in Nepal waved a Nepali surgeon in training into the operating room. He was an intense and quiet 26-year-old named Shankar Man Rai. He watched the ReSurge team work on a child whose face was distorted by a cleft lip. Rai knew what the future would likely hold for the young boy without intervention — no schooling, social isolation, shame for the family. Surgeon Shankar Man Rai (left) removes thick scars from a burn patient at the Nepal Cleft and Burn Center at Kirtipur Hospital in Kathmandu. The surgery began. "I didn't speak to anybody," Rai remembers. "I just watched." And he was stunned that a quick surgery could have such a profound effect. "At the end of 45 minutes, the face of the baby was normal. You could see only a small line of incision," he says. The operations were enormously satisfying to the patients and to the surgeons. Rai fell into a natural rapport with the ReSurge surgeons. They invited him on trips to rural outposts in Nepal to train him. 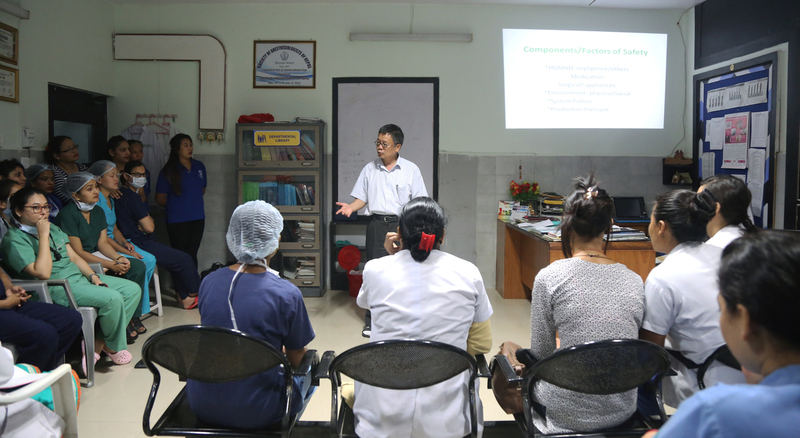 But it wasn't a formal training program, and eventually Rai got to thinking, Why shouldn't other Nepali surgeons be involved? Then came a 1998 trip that started the group's rethink. Rai and Dingman were traveling together in Nepal. "We had lots of time to talk and speculate about the future of medicine and the role of our group," Dingman says. Over a quiet dinner, Rai with great patience and logic explained that the best treatment for a poor patient in Nepal should come from an indigenous surgeon trained, equipped and funded to provide such care — and available for follow-up. Dingman was inspired by Rai's logic and passion. "He convinced me in a gentle way that we could do things better," he says. But he says he "soon realized it was not going to be easy." Dingman was then chief medical officer for ReSurge, and when he got home from the trip, he started trying to sell the idea to the board. "The idea of local doctors being trusted to do their own surgery was ridiculed in the boardroom," he says. He had allies within the organization, but many of the doctors on the board said they enjoyed helping the patients. They wanted to continue. There were hours of passionate discussions about whether local doctors and nurses could be trained and should be paid, since the foreign doctors weren't paid. Opponents of the plan pointed out that ReSurge would have to find money to pay the local health workers. 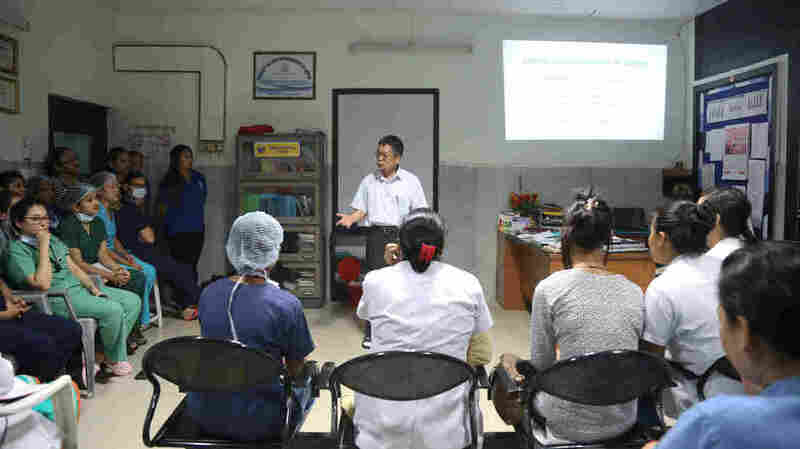 Nepali surgeon Shankar Man Rai frequently lectures to nurses, therapists and other health care workers on the special needs of burn patients at Kirtipur Hospital in Kathmandu. ReSurge COO Beverly Kent remembers someone predicting that local doctors would buy themselves pricey Mercedes cars. (For the record, Rai, who has since gone on to do surgeries for ReSurge, is paid a few hundred dollars for each operation and drives a small, beat-up Honda that doesn't feel all that safe on the rocky streets of Kathmandu.) The arguments were so intense that Dingman feared he would lose his position as chief medical officer. But Dingman and several others in the organization persisted through several years of battle, and ReSurge began adopting Rai's revolutionary vision. In 2018, ReSurge sponsored five team fly-in trips for surgery in Nepal — and 24 educator trips, plus ongoing classes for local doctors and nurses. In 2017, ReSurge trained 858 medical professionals around the world. 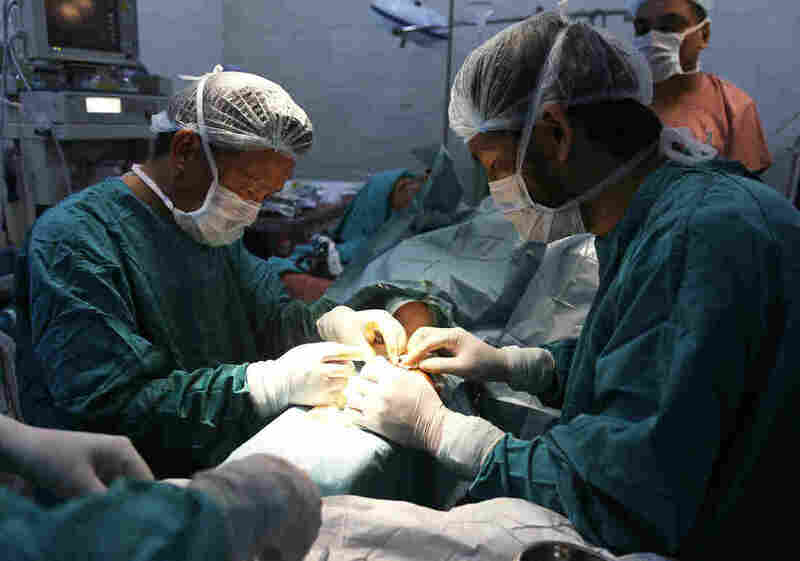 The health professionals whom Resurge calls its "developing world partners" in Asia, Africa and Latin America did 91 percent of the 4,101 procedures sponsored by the organization for cleft palates, burn scars and deformed hands, eyelids and ears. The theory behind the ReSurge rethink is becoming part of today's medical mission philosophy. There's a growing recognition that teaching local health care providers results in more patients getting needed surgery over time than with short-term fly-in events, and that patients are often more comfortable with doctors and nurses who speak their language and understand their values. Yet the change has been bittersweet. Some American doctors and nurses have lost the opportunity to do surgery in far-off lands. "We took that away from them," says COO Kent. "We lost a lot of volunteers." But they're attracting a new kind of volunteer — people excited about the chance to teach. Since it began, ReSurge has primarily been funded by private sources — doctors and medical companies. There was some concern that support from both groups would disappear. Not so. Kent says the group has gained support. While ReSurge was likely one of the first of the traditional medical missions to switch to training, it is far from the only one. CMMB (Catholic Medical Mission Board), for example, has been building up its training programs over time. Its fly-ins are more like move-ins; volunteers remain for six months to a year. Smile Train, which focuses on cleft lips and palates, as ReSurge does, boasts on its website of using the "teach a man to fish" model. Philippe Blasco, a training adviser for Doctors Without Borders, says that the group has been training local health professionals for 25 years, mostly on an informal basis. And some missions began as joint local projects, like the Himalayan Cataract Project, run by two ophthalmologists, one from Nepal and one from the United States. ReSurge officials today say there was a time and a place for the fly-in approach, when they were traveling to places that had no medical system to build on. But even critics of the fly-in approach concede there may be isolated instances today where it's appropriate — for example, where there's an immediate need, like after a disaster, with not enough time to train local health providers. 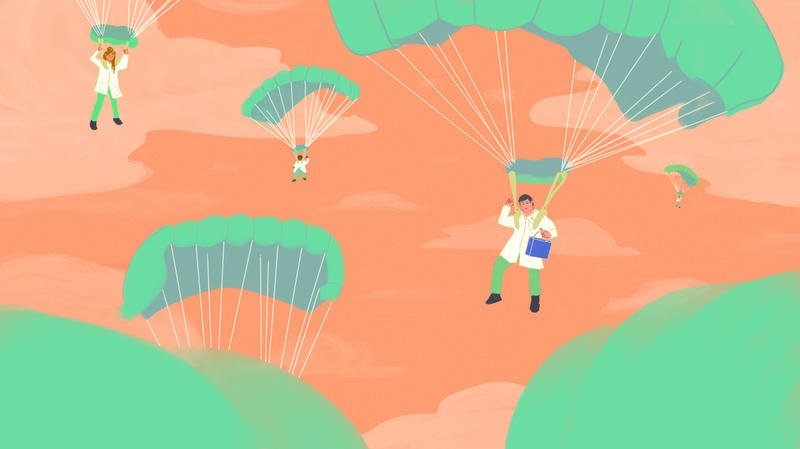 William Cherniak, a physician who is collecting data on the effectiveness of various types of missions, is one of the defenders of fly-ins — under certain circumstances. "The gut reaction of a lot of academics is to rag on organizations doing short-term work," he wrote in an email. "But from my perspective, if that work is tied to a local partner, it can be sustainable." Cherniak is co-founder of Bridge to Health, which sends health professionals and graduate students to poor communities to run clinics and train local health care workers. He says that working closely with local groups, which not all mission groups do, is key. The U.S. government doesn't regulate the groups that still do short-term fly-ins or, for that matter, the groups focusing on training. Governments on the receiving end, as well as donors, are left to figure out whether a charitable group is qualified to provide care or training. Loh, the Canadian physician who studies short-term medical missions, is involved with a new group that is working on guidelines and strategies. The goal is to ensure that missions form a mutual partnership with host communities. The American College of Physicians recently set up new guidelines for doctors and medical students considering work abroad that emphasize the importance of respecting local customs and collaborating with local health care providers — something ingrained in the ReSurge approach. Loh, who finds himself counseling med students and young doctors who are considering trips, traces some of the rethink to the influence of blogs. He cites a blog post by self-described voluntourist Pippa Biddle, who 10 years ago, with other young voluntourists, worked on constructing a library for orphans in Tanzania. Their work was so bad that local men, in an effort to save the visitors from embarrassment, regularly tore down the construction at night and rebuilt it correctly before the volunteers awoke. It wasn't fly-in surgery, but Biddle's conclusion — that it would have been far better to have just paid local people to do the work — resonates with Loh's students. About a camp for children with HIV in the Dominican Republic that she and others started, Biddle writes in her blog post, "Try caring for children who have a serious medical condition, and are not inclined to listen, in a language that you barely speak." Loh says the med students who come to him for advice are beginning to back off from fly-in missions. "A lot of students are much savvier now," he says. "They don't want to do something that's nonsustainable." Where a medical camp might do 75 to 100 surgeries on a once-a-year two-week mission, within a couple of years of ReSurge's switch to support in the early 2000s, Rai and his colleagues were performing more than a thousand surgeries a year. Late last year, several people from ReSurge visited Tanzania and Zimbabwe, the first move toward setting up training programs there. Dingman, who pushed for the changes Rai wanted, is now retired. He still misses his years with Interplast and the tremendous high of flying in to do surgery. "Surgeons always miss doing surgery," he says. Still, he says working to change ReSurge's mission is the most important thing he has done in his life. Have you participated in a fly-in medical mission to a developing country? Tell us about your experience. What did you do? Was it effective? Would you do it again? Share your story in the form below. Your response may be included in a story for NPR. The form for submissions closes on Monday, March 29.